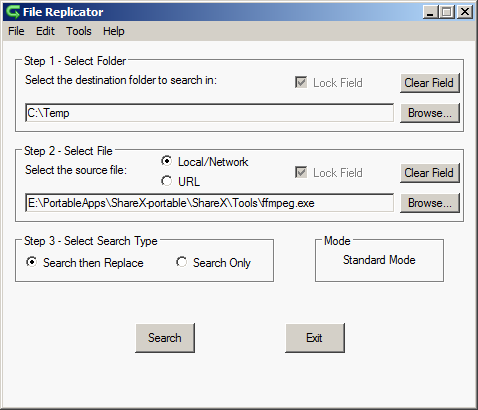 File Replicator is a batch file search-and-replace that lets you modify all instances of a file in a destination directory or drive without having to manually search. For example, if 7-zip.exe is a component of many programs in your portable collection, you can enable the latest-and-greatest version added to all of them. Simply select the destination to search (e.g. USB drive letter) and the file you wish to replace. From there it will search the drive and show a list of successful files found and ask if you wish to overwrite. Engine upgraded to AutoHotkey v1.0.48.05. Added Windows 7 to the supported and tested OS lists. Removed Windows Vista from the tested OS list because I no longer have any PCs running Windows Vista to test on. The OS will remain on the supported list. Includes v2 Revision 2.1.0 of the File Replicator Manual. Installer upgraded to Script Setup Utility v2.6.1. Made several changes to how version information is interpreted and displayed. @billon and bitcoin: Couldn't find a mirror either. Added note to entry.